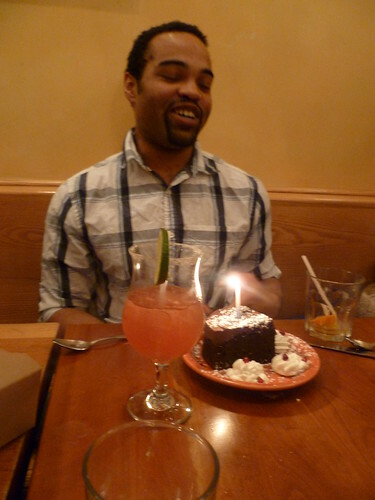 Last Friday, a bunch of us finally got to try Ithaca’s famous Moosewood Restaurant for Matt’s 25th birthday. Normally vegetarian/vegan restaurants don’t really appeal to me but given the restaurant’s excellent reputation and the huge number of cookbooks it’s published over the years, I thought it’d be a shame not to go. 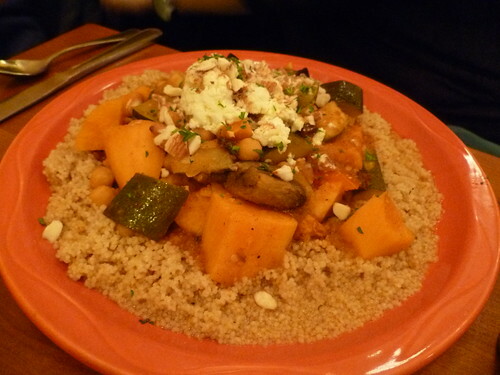 Moosewood is pretty unique in that it changes all of its dishes, both lunch and dinner, daily. Usually I like to scope out a restaurant’s menu items and decide what I’m going to eat beforehand, but in this case, I had to be a little more patient. For drinks I ordered a refreshing grapefruit basil martini that wasn’t bitter at all, despite the fact that the waitress said it definitely wasn’t on the sweet side. The pomerita (essentially a pomegranate margarita) that Lilian ordered was a bit too sweet for me, and I still like tequila least of all the hard liquors, but Esther’s Apple Jack cocktail was delicious, spicy, and tummy-warming. 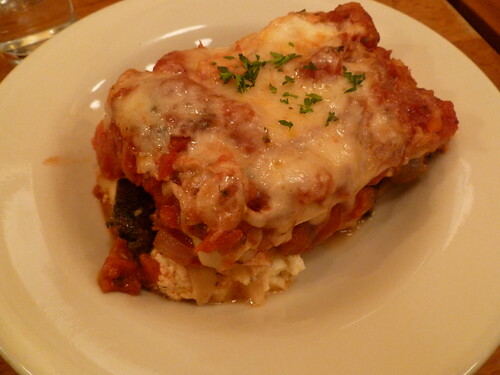 That night three of us ordered the hearty and cheesy grilled fennel and portobello lasagna. The portion was huge, but somehow I managed to shove it all down my throat. Youjin’s Morrocan dish was a beautiful array of winter vegetables over couscous, and Matt’s salmon en papillote, though somewhat lacking in color and excitement that usually comes with this kind of a dish (where you tear open the package to let out all the wine-and-herb-infused steam), was nevertheless well-seasoned and cooked perfectly. We ended the dinner with a chocolate vegan birthday cake, which I had a hard time liking. The top layer, which I think was a sad attempt at frosting made without butter, tasted more like that chocolate freeze-dried ice cream that astronauts typically eat. The rest of the cake was extremely dry and crumbly. I only took a couple forkfuls before completely giving up. So while I don’t think I’d ever get dessert at Moosewood ever again, they actually do a great job of cooking up satisfying and delicious vegetarian dishes without coming across as overly-hippie-ish. Plus they seem to have a lot of deals and promotions during the week which would make a visit even more worth it. 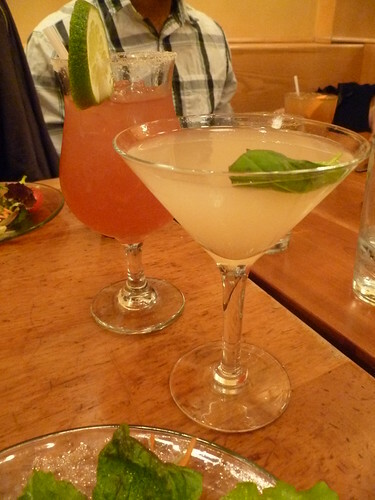 You are currently reading Moosewood for Matt’s Birthday at Notes on Food.